Freedom and Zelda. 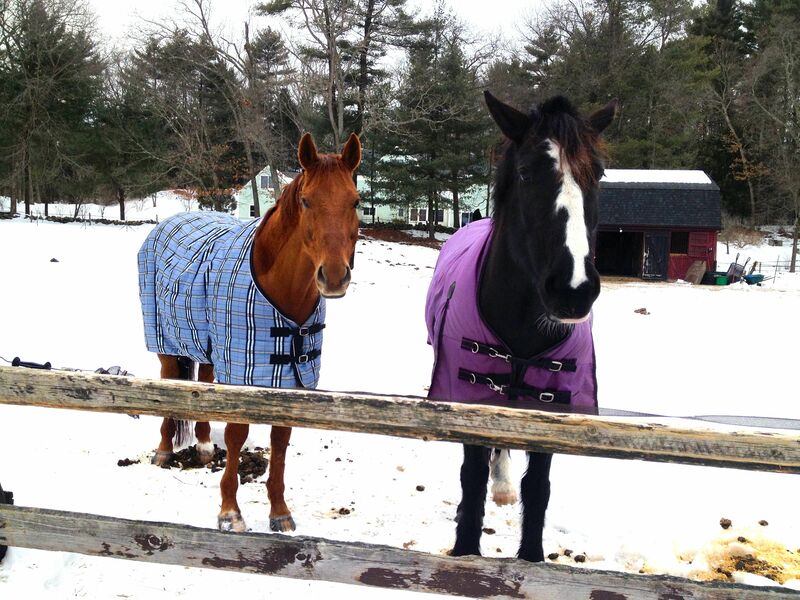 You can see that while Freedom is very happy to have a new mare in “his” herd, Zelda isn’t quite so sure. It’s always nice to see the happy, smiling faces of your horses when you drive up to the barn. The problem I had yesterday is that Freedom and Zelda are not turned out together. At least they are not supposed to be in the same pasture. And up until now, they never have been. However, when I arrived, the fencing between the two paddocks was down and the horses had played musical chairs with their turnout. Freedom and Willow were over at the Red Barn with Zelda and Charlie and Curly were at the Gray Barn. The good news? No blood and all horses were walking on four legs and looked sound. The bad news? Due to the cold weather, the plastic step in posts that used to hold up the electric had snapped in half. The worse news? The ground was like cement. Not the ideal situation for making fencing repairs. Luckily, when I found the problem it was still only 3:30 in the afternoon so I had enough daylight left to plan out my options. Freedom was mighty pleased with the arrangement. As far as he’s concerned, the mares are all his, and Zelda is just the latest to join his herd. His vote was to leave the fencing down but maybe remove Charlie to another planet. Although I have never seen him act aggressively toward Charlie, I have also noticed that the times when they’ve been out together, Charlie is banished to the far reaches of the turnout. Zelda? Well she looked skeptical. She certainly wasn’t aggressive toward Freedom; rather she had the air of a long-standing beauty queen who is just a bit tired of the devotion of her fan club. She retreated to the sanctity of her stall and so I shut her in with some hay. Willow? Frankly, she looked annoyed. She’s supposed to be Freedom’s main squeeze and she wasn’t taking kindly to being the third wheel. She looked relieved when Zelda retreated to her own space. Charlie? He didn’t make a fuss when I put him back into his own turnout. The restored fencing. 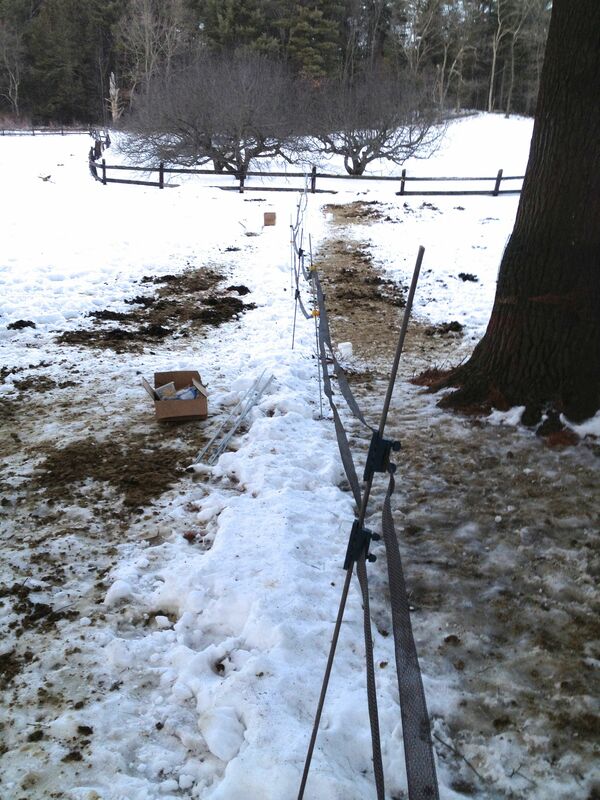 I used fiberglass poles instead of plastic and we used a drill to make holes in the frozen ground. I think he’d gotten the message that Freedom was not letting him near Zelda or Willow, and he was probably just as glad to stay away, since he and Zelda try to boss each other around. As for Curly? She’s the non-confrontational one. She waited until I’d restored order and put out hay. Then she cautiously made her way back to the Red Barn. In the end, I brainstormed with Tim, who does maintenance on the property. He brought down a half inch drill and made holes in the frozen ground. I put the fencing back up using fiberglass posts (I poured water into the holes around the poles and they froze into place quite nicely). When/if it finally thaws we’re going to have to do a major re-fencing project at the barn, but at least for the short term, I’m hoping this will stay in place.